Maldon & Burnham Standard, 30 June 2005. Maldon Town Hall, 21 June - Happy 100th birthday to Maldon's Marine Lake. 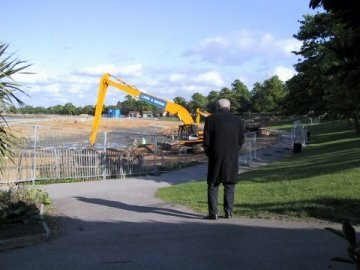 What should have been a celebration was more like a wake to mark Tuesday's centenary of the now ravaged and unrecognisable pool in the park. But most of the tears shed in the packed Town Hall were of laughter when "retired Maldon fisherman Tablo Yardley" passed his opinion on the district council's decision to turn the salt water lake into an ornamental pond. To sum up Tablo's rant, real Maldonians are bolshy and argumenatative by nature and if the council won't listen to the hearts and minds of the people they claim to represent, be it on their own heads. But 95 year-old Tablo didn't just go on about the Marine Lake. 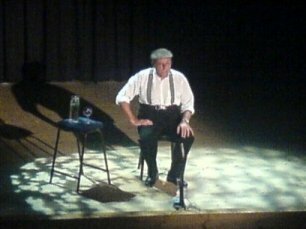 Much of his monologue was taken up with his own troubled waters - his prostate problems - and why very elderly Maldonians don't like visiting St Peter's Hospital because the remember when it was the Workhouse. If you went in there you never came out, apparently. Then there was the Battle of Maldon. One family still keeps Byrhtnoth's missing head in the garden shed. They use his helmet as a coal scuttle, according to Tablo.